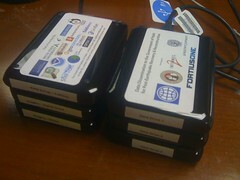 In a joint project with the World Bank, USAID, and numerous other partners, there are now 6 TB hard drives on the ground in Haiti with mapping tools and satellite and remote imagery data being shared with the Haitian government. Read more about the project on the FortiusOne blog. Schuyler Erle and Tom Buckley will be heading down on Tuesday to provide on the ground support between the government agencies and the community. A tremendous thank you to the numerous individuals and groups that helped and provided tools or data: World Bank, San Diego State University / Calit2, Internet2, Georgetown University, DigitalGlobe, Delta State University, Sahaha, Crisis Mappers, OpenStreetMap, NOAA, Ushahidi, DevelopmentSeed, TelaScience, STAR-TIDES, CrisisCommons, USAID, GeoCommons, OpenSGI, GeoEye.